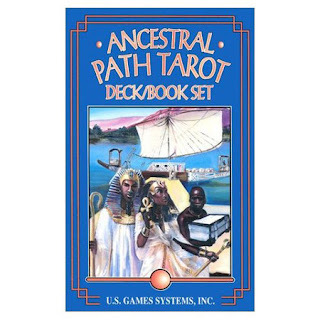 The Ancestral Path Tarot is one of the most unique sets of tarot cards I have ever seen. Usually, I see decks having only one common theme or look (celtic, fairy, gothic, etc). While The Ancestral Path Tarot does have its theme of the path you take (or may take) and the journey and evolution of problems and situations from their causes to their conclusions, what really sets this deck apart is that, unlike most decks, each suit in this deck has its own look and story. Another interesting difference between this deck and most decks is that in this deck, there are no reversals. Cards are only given one meaning each. I suppose an expert reader could interpret the reversals as they saw fit, however, for the beginner, this is a good way to get familiar with doing reads and learning the cards, giving them just the one meaning. However, if you look closely, you can see that the card she is holding up is The Fool, and it has her image on it. That kind of “image within an image” is an invitation to observe the cards very very closely, and down to the most minute detail. Experienced readers will find many tiny, almost hidden images within the cards, allowing you extra layers with which to do your reading. This deck also offers up new spreads for these cards, as well as new takes on classic spreads. Two new spreads work very well. The first is a Direct Path Spread, in which cards are laid across the table in a line (the photos shows it isn’t a straight line, as most paths wind a little, so some cards are slightly higher and slightly lower than others. This spread is used to show the progression of a problem, issue, or decision from its history, to its current path, to its conclusion, ending in a springboard to the next circumstance/problem/issue/path. The other new spread worth mentioning here is a Fork In The Road Pattern, in which, after laying out a card for the influences on the issue, and the current state of the issue, the reading breaks off into two forks, giving you two possible paths and two possible outcomes, so you can see the progression and consequences in each of the two choices you face in resolving your question. Seeing both paths, and both possible outcomes will give you a better insight into what your decision will be. The imagery in this deck, combined with the uniqueness of the four cultures in the four suits makes this, truly, one of the most beautiful and unique decks I have ever seen. The Ancestral Path Tarot Deck is really beautiful. It's the first time I've seen it and it really speaks to me. Thank you for a great review and all those beautiful images. The 'fork in the road' spread sounds interesting. I'll research it a little more and try it out myself.